Push-ups are one of the exercises that are most frequently learned during adolescence as this exercise is simple, straightforward and well-tested. It also builds up your triceps and chest while working your core. 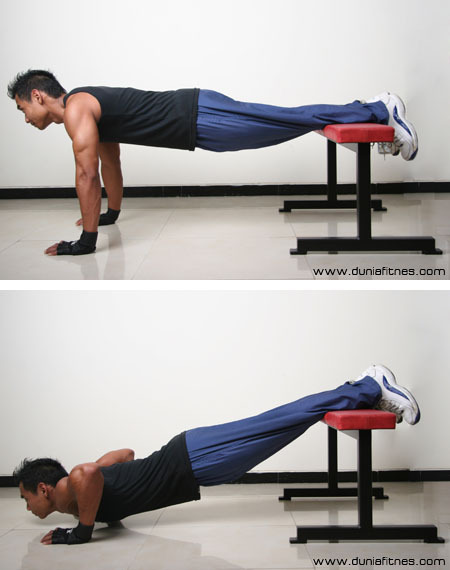 If you do simple variations the push up will also help different collections of muscle groups. Here are thirteen different methods that range in difficulty from medium to very challenging, such as the Aztec push up which is the last one on the list. The wide grip push up is a classic that is more challenging than the standard version because the wider grip means that there is less leverage in order to help push yourself up. A good way to try out this variation is to start with a wide grip version of the push up and as you do more repetitions, bring your hands in closer. It is important to always keep your hands somewhere below your shoulders’ plane as well as to pay attention to your elbows, ensuring they do not excessively flare out. This is the best way to ensure the stimulation stays on your triceps, shoulders and chest as opposed to just the shoulders. If you are looking for a push up that targets your triceps, then try the diamond push up. To do this push up properly put your index fingers together as well as the thumbs, making a diamond shape with your hands. This type of push up may but a great deal of pressure on the wrists as well as the shoulders and elbows which is why some people avoid it although others love the benefits. 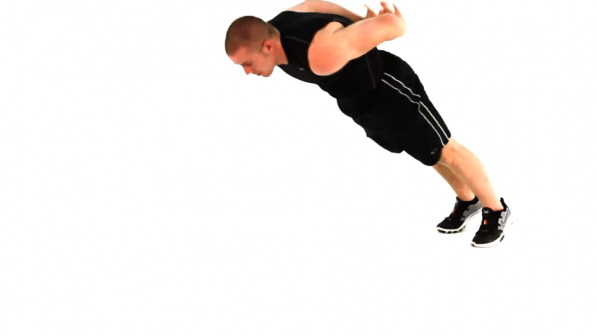 The front clap push up is the basic military version where the goal is to use force to push your body up off the ground enough to be able to clap your hands together in front of you. After clapping your hands, you return to the normal push up position. When done regularly this push up can help you develop more explosiveness while pushing up as well as engage the muscle fibers found in your chest. As much as the front clap push up requires explosiveness, the behind-the-back clap one requires even more. This push up is similar to the front clap with the sole difference that instead of clapping in front of your body you do so behind your back. 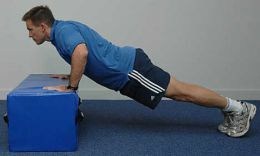 This push up is ideal for those who are looking for a plyometric push up but be warned that it is easy to develop sore wrists from hitting the ground with a great deal of force. To do the plank push up, place your forearms on the ground so your weight is distributed between them and your toes. You should then tuck in your hips and keep your body straight from the shoulders to ankles, holding the position for five seconds. This push up is great for posture as well as midsection stability and endurance. If you have mastered this position for five seconds at a time, try increasing the hold to 30 seconds. Although a one arm push up seems as if the theory should be simple, there are two things you need to keep in mind to be successful. You must be strong for your weight and try to keep your legs very wide apart (as far as you can) to create a stable base. You can opt to place your hand in a normal push up position or angle it perpendicular to your body. It is also important to keep in mind that this type of push up will put a great deal of strain on the elbows and shoulders so you must be warmed up before doing it. The one leg push up is a great way to focus the attention on your shoulders. To do this push up, begin with your palms and chest on the floor with the palms at shoulder height. Ensuring that your legs are straight, put one foot on top of the other ankle. This will mean only one of your feet is touching the ground. After this, simply continue as if it were a normal push up. For an extra variation you can lift your top leg into the air. 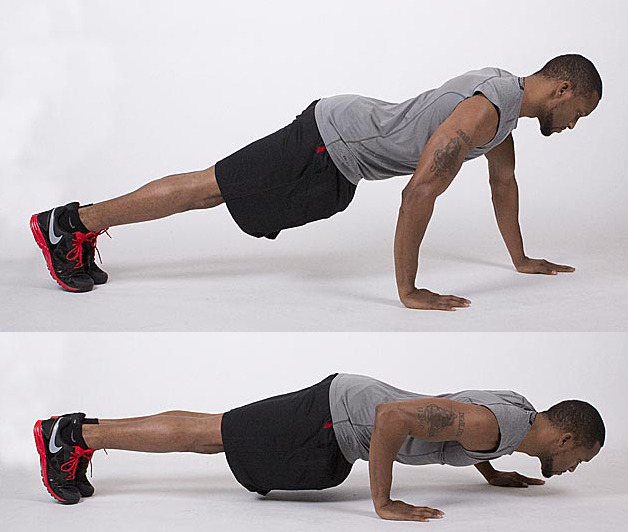 As opposed to a traditional push up the knuckle push up will build strength in both your chest and hands. If you are a beginner, it is best to do this push up on a soft surface to avoid injuring your knuckles. You should start by making each hand into a fist, ensuring that they are tight and the thumb is on the outside. Get into position, starting with your knees on the floor then rise up to the starting position where you will be flat with your chest and knees off the floor. For each repetition you will slowly lower yourself down to the floor so that your chest touches it. 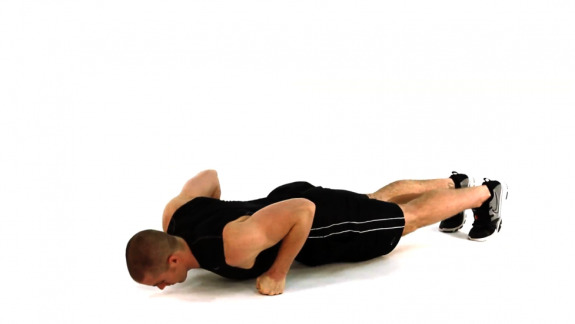 To do a staggered push up you should place one hand around 6 inches higher up than the other hand as this will make the lower hand work harder. This is a challenging variation that will help you achieve great burn in the shoulders and chest. To do a decline push up simply elevate your legs and proceed to do a normal push up, attempting to straighten your arms enough at the peak to create a flat line from your shoulders to ankles. It is important to keep in mind, however, that this type of push up can be very hard on the wrists. The incline push up is basically the opposite of the decline push up in that your arms are on a higher surface than your feet. This puts the emphasis on your shoulders and makes it a bit simpler than the standard version. Be sure to pick a wide enough surface for your hands so that you can have a proper grip and keep in mind that the push up is harder if the incline is lower. The T-push up can work as a warm up as well as a workout as it is a great way to warm up your shoulders and core. 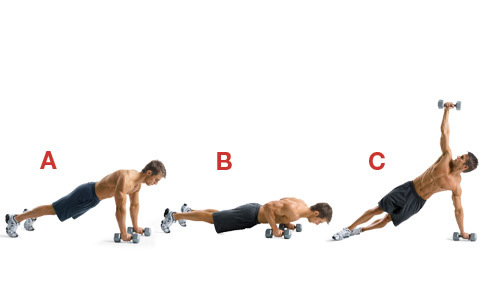 It is like a standard push up but after each rep you put all of your weight on one of your hands instead of both with the other hand pointing up to the sky, creating a T-shape. Be sure to switch which hand you lift after each push up. This is one of the most difficult push-ups to try and it is easy to end up on your face if you are not careful. Like the clap push-ups this one requires a great deal of explosiveness as you will be pushing yourself into the air and bringing your hands down to your feet (keeping both your arms and legs straight). For better success, try pushing forward with the toes right before exploding off the hands and you can always try clapping your thighs before aiming for the toes. Be sure to warm up before you do any exercise as this gets your muscles ready and reduces your risk of injury. You will notice that you are able to do more push-ups if you warm up properly before starting. You should also be sure to stretch the wrists and arms before doing a push up. Should You Eat Before or After Working Out?